The Sámi Museum and Nature Centre Siida is located in the lovely village of Inari, about 40 kilometres north of Ivalo Airport. Siida is a very popular place to visit and offers you the unique opportunity to acquaint yourself with changing exhibitions on culture, art and nature throughout the year. Siida offers the visitor both exciting experiences that appeal to many senses and expert knowledge. In the summer season, the indoor exhibitions of Siida are complemented by the cosy open-air museum. In addition to exhibitions, events that focus on culture and nature, as well as seminars, are arranged at Siida. At Siida, the National Museum of the Finnish Sámi and the Nature Centre of Metsähallitus work together. Tourist information and restaurant services are also available. Inari village is located 70 kilometres north of Saariselkä and about 35 km from Ivalo. The lovely village of Inari is the centre for Finland’s Sámi culture. Close to the village of Inari you will find plenty of possibilities for spending some great time outdoors. Lake Inarijärvi, right next to the village, is one of the largest lakes in Finland, a true beautiful inland sea with over 3,300 islands. 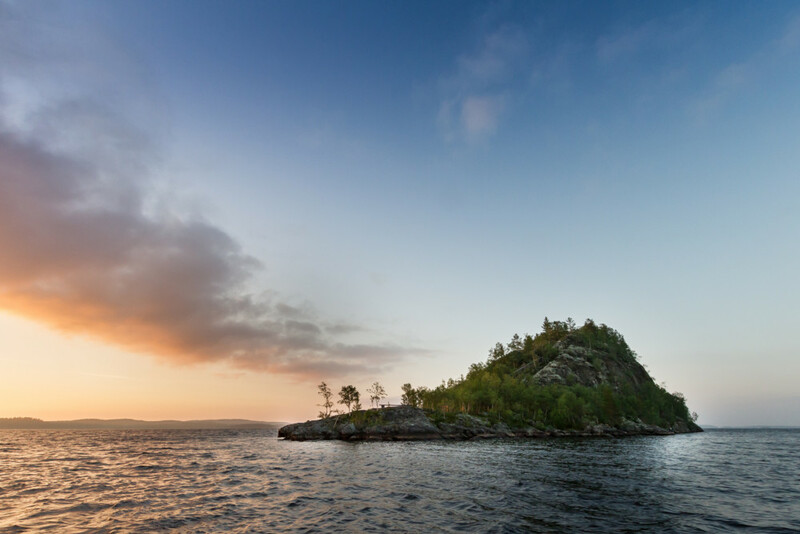 One of the most popular destinations is the sacred island named Ukko or Ukonsaari. You can reach the island using a ecological catamaran, setting off from the village centre near Siida or participate in a guided snowmobile tour in the winter. The enormous Lake Inarijärvi is also an experience in itself, located between picturesque fells and forests. However, we encourage you to experience the lake only when accompanied by a local guide, as weather conditions can quickly change from sunshine to storm due to the closeness of the Arctic Ocean. There are also lots of hiking, skiing and fishing opportunities around Inari, and plenty of smaller lakes and streams to enjoy. From Sámi Museum and Nature Centre Siida you can walk or ski through the forest to reach the picturesque old Pielpajärvi Wilderness Church. You can also take the Nature and Culture Trail of Juutua from Siida and follow the trail along River Juutuanjoki. Some of the trail is easy and also accessible for visitors with wheelchairs if assisted, for example the route to the Jäniskoski white water section. There is also a variety of different amenities for hikers from rental cabins to campfire sites and outdoor toilet facilities. If you fancy fishing, you can ask about fishing licences and get a map of local lakes and rivers from Siida.